Ireland | The Great Canadian Travel Co. In October, I was part of a group of travel agents who went on tour jointly sponsored by Tourism Ireland and Tourism Northern Ireland. We were so fortunate, as this was the first familiarization trip that combined both countries. It was a whirlwind trip, quite literally, and so much fun. I was lucky enough to travel with a fabulous group of people from all across Canada, from Vancouver to St. John’s. In no time, it was like we’d always known each other. You can fly into Belfast, but Northern Ireland is just as easily accessible from Dublin airport. With WestJet, Aer Lingus, and Air Canada all flying into Dublin, there are so many options for flights. We flew WestJet via Toronto, and although the landing in St. John’s was bouncy due to the wind, I can’t complain about the extra stop. It broke the trip up so it didn’t seem quite so long. I experienced the same friendly service and on-time flights that I have come to expect from WestJet. 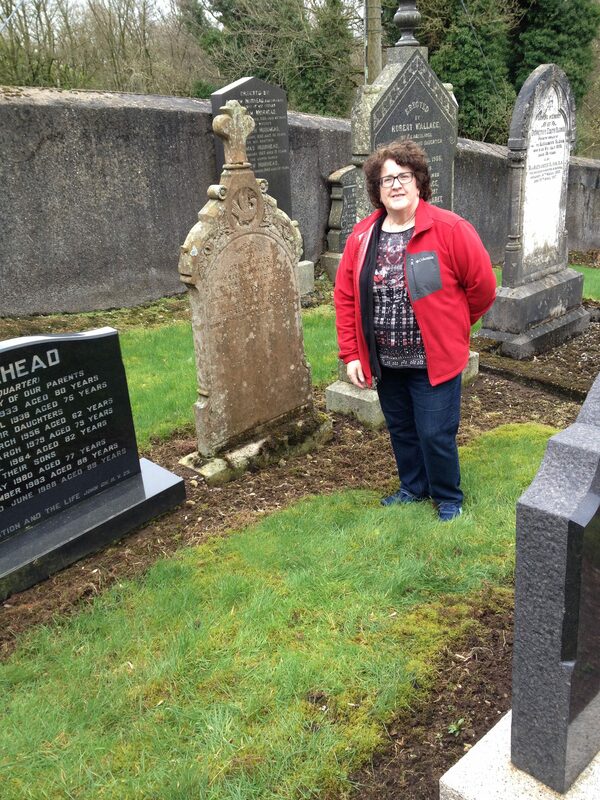 On arrival in Dublin, we were met by our guide, Lynn Corken, who was very welcoming and informative. Her Northern Irish accent is lovely, although it does take a bit of getting used to. For quite a while, we all wondered where this Kine-ty Dine (rhymes with ninety-nine) was located, then laughed at ourselves when we realized that’s where we currently were, County Down. 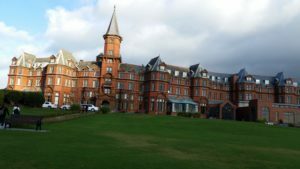 From the airport, we went straight to Newcastle, where we had tea at Slieve Donard Hotel. It’s a lovely, historical seaside resort, and hosts Van Morrison concerts every August. The tea and cakes were lovely, and the view was dramatic, with sunshine in one direction and ominous black clouds in the other. Later that afternoon, we were hosted by Tracy Jeffrey, who offers cooking demonstrations for couples to small groups in her home. We sampled savoury potato pancakes made by the charming Fred, along with black pudding and dulse (seaweed) butter. Yummy, believe it or not. As if that weren’t enough, we were served a delicious home-made lunch of soups and breads, along with assorted cookies for dessert. We all left armed with recipes provided by Tracy that we all vowed to try at home. Our next stop was Titanic Belfast. The museum, opened in 2012 just shy of the 100th anniversary of the sinking, certainly lived up to its name. The building is imposing, looking itself like a gigantic ship. The exhibits are very well-done, with many artifacts as well as hands-on exhibits and videos. We has only about 45 minutes to zip through the entire museum, which is nowhere near enough time to do it justice, but we enjoyed our tour all the same. That night, we stayed at Europa Hotel in Belfast, which was once the most-bombed hotel in Europe. It’s centrally-located near many restaurants, pubs, and a few tour operators. More than one person in our group was disappointed to learn that our trip was not planned to coincide with Van Morrison’s appearances at the Europa hotel on December 4th and 5th. Across the street from the Europa Hotel, is the nearly-200-year-old Crown Liquor Saloon. It is decorated with mosaic tile floors and mahogany wood carvings. The snugs (booths enclosed by stained-glass walls and a door) were a great novelty for us, and although it was really tough, we forced ourselves to wait (with a whiskey or a pint, of course!) until one of the snugs was vacated and we could enjoy a pint or two in the cozy little room. Sadly, although the service bell still works, it did not summon a bartender for a refill of our drinks and we had to make the (sigh) long trek to the bar a few feet away. The next morning, we had a short tour of Belfast. It reminds me of Glasgow, both once primarily industrial cities, now with a revitalized waterfront and more commerce than industry. 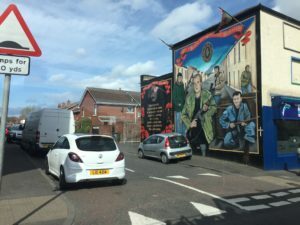 We viewed the Peace Murals on Shankill Road, and I was surprised to learn that there are still gates in the walls that close every night at 7pm, keeping the Catholics on one side and the Protestants on the other side. It appeared to be a very peaceful city; even wandering around by myself lost at night, I never felt unsafe. The gates seemed such an odd contrast to that feeling, and they were something I never expected to see in a Western European country in 2017. 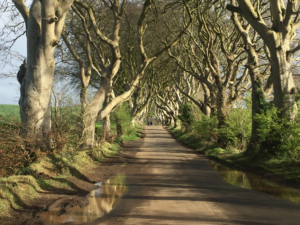 After our brief tour of Belfast, we headed out on the Causeway Coastal Route, which is a spectacular drive along the shore of the Irish Sea. 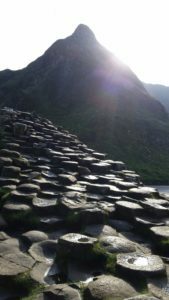 The drive from Belfast to Giant’s Causeway can be done in two hours, but if I were doing it again, I would prefer to take at least a day, and perhaps even a few. There are several appealing little towns along the way that I would have liked to stop in, and many lookout spots with fantastic views. The road is winding and curvy and not particularly wide, but otherwise in good condition and an easy drive. About an hour into our journey on the Causeway Coastal Route, we stopped at Glenarm Castle and Tea Room in Ballymena. The grounds are beautiful, lush and peaceful. The walled garden, stunning even in autumn, is almost certainly a popular location for wedding photos. The expansive estate and working farm has been in the McDonnell family for more than 400 years. This historic house is the private residence of Viscount & Viscountess Dunluce and is open to the public only on certain dates, so visits must be planned in advance. The Giant’s Causeway Visitor Centre provides extensive information about the history, geology, and legend that created the stunning landscape of mostly hexagonal basalt columns. However, the Visitor Centre was closed that day due to the threat of Hurricane Ophelia. 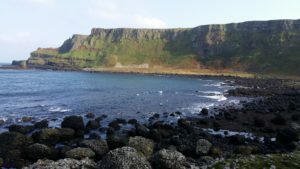 We were fortunate enough that the weather cleared up completely just as we arrived at Giant’s Causeway, and the wind and rain started up again as we exited the bus for our lunch at Smugglers Inn only one kilometre away. The timing couldn’t have been more perfect and we thrilled that we were able to see the legendary stones in person. We raced down to the shore and back up the hill in about 45 minutes, but I would certainly suggest taking more time for a leisurely stroll to enjoy the scenery. Near Giant’s Causeway and not for the faint of heart​​ is ​Carrick-a-Rede rope bridge​. It spans 100 feet over an open gorge to an island, so the only way off is back along the rope bridge. At least one uninformed acrophobic soul has had to be rescued by helicopter after realizing that the bridge did not lead to a peninsula. Frankly, I was extremely relieved that the bridge was closed that day due to the impending Hurricane Ophelia. Last year, I saw photos of the rope bridge, and just the mention of its name caused me dread even before we arrived. I’m sure my fate would likely have been the same as that poor woman’s. 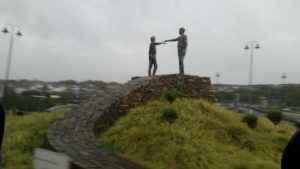 Derry/Londonderrry is built around an ancient walled city. It is also known as the best Halloween destination in the world. Unfortunately, everything was closed when we were there, again due to Hurricane Ophelia, but still it was an interesting city to walk around. Martin McCrossan’s yellow-shirted guides conduct inexpensive tours (£4 per person) of the walled city. They recount the fascinating history of the area, and explain why the city has two names. That night in Derry, we stayed at City Hotel. My room had a view of the striking Peace Bridge and the near-empty traffic roundabout in front of the hotel, and the wind sounded fierce from up there the fifth floor. City Hotel is a nice hotel in a good, central location. The rooms are very spacious and clean. The in-house restaurant had good food, but the service was a little lacking. However, we chalked that up to the hurricane and assumed they had conscripted staff into doing jobs they do not normally perform, since many people were unable to make it to work that day. 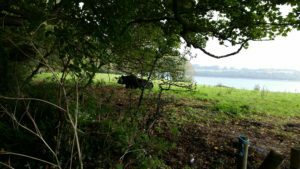 Hurricane Ophelia turned out to be much ado about nothing in the north, but it sure created a stir. Everything in the country was closed because of the frequently quoted ‘health and safety,’ from schools and offices to shops and restaurants. A few of us crazy Canadians had to go for a walk to see what it was like being in the midst of a hurricane. We figured, we handle blizzards on a regular basis. How bad can a hurricane be?! It was rather surreal to stand in the middle of an empty street in downtown Derry during rush hour. In that area of the island, the hurricane amounted to just wind and rain. Touring Giant’s Causeway in full sunshine under a bright blue, cloudless sky, I couldn’t help but think, “Inclement weather? HUH??? What a bunch of sissies! They should come to Canada in the winter and experience REAL inclement weather.” However, after hearing news reports, we realized that hurricanes are indeed nothing to take lightly. The storm was much worse in Cork, 350 kilometres to the south of Derry. Several people were killed by falling trees, and a stadium lost its roof. We were grateful that it was only a minor inconvenience in Northern Ireland, with some of our activities being modified or cancelled. However, this was just a reminder that unpredictable weather and unforeseen events are all a part of travelling, and one has to go with the flow. Luckily, everyone in our group took the changes in stride, as did our unflappable guide Lynn and stoic driver Niall. The events that day added a sense of adventure to our trip and let us proudly we survived Hurricane Ophelia. It certainly didn’t negatively affect my opinion of Northern Ireland. I can’t wait to go back again. Being at the Guinness™ brewery in Dublin got me to thinking about the Guinness™ Book of World Records. 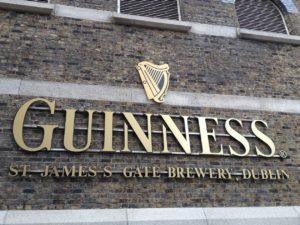 Was it related to the famous Guinness™ stout I’d learned so much about at the Guinness™ Storehouse? 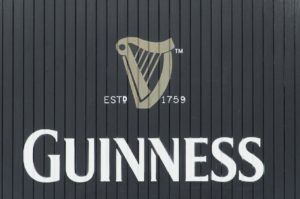 Guinness™ – it’s a food group! OK, well maybe not technically, but ask any true-blooded Irish person and they’ll tell you that “Yes, it makes a nice snack or small meal!”. And why wouldn’t it? It’s made of really good natural food stuff, all locally sourced. Winter is coming… well, not really, but my train is coming to Dublin station. It’s 7:20 in the morning and I am on a Railtours Ireland train for a 2 day, 1-night trip to Belfast, complete with a Game of Thrones and Giants Causeway tour.